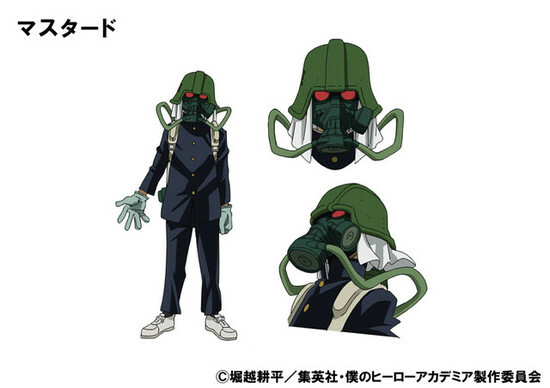 Boku no hero academia Season 3 new villains finally announced. Since the first season aired Boku no Hero academia got a lot of attention. One Punch man broke the ice with the hero genre for anime. And Boku no Hero academia took on the torch of shounen anime and jumped straight into the hero business. When I was a kid One Piece and Naruto were airing. And everyone was hyped about it, not Boku no Hero academia takes its place in the industry. How long will it take depends on the authors. After season 2 I could not help myself but to go and read the manga. So I mostly already know of everything that is going to happen. However, seeing it again in a form of animation is something I’d like to do. 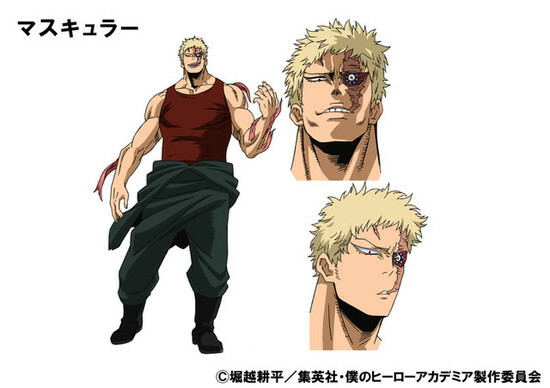 And that is why the news for Boku no Hero academia season 3 new villains made me excited. The third season will premier on April 7th. This paragraph may contain a bit of spoilers. Mustard, Moonfish, and Muscular are characters you have probably not heard of if you have no read the manga. However, the anime is about to adapt the school trip arc. And these characters are going to have a lot of screen time in it. The trio ambushes the kids while they are at camp. And students then have to deal with them facing a near-death situation. Will they die or survive? It’s a shounen so probably survive. 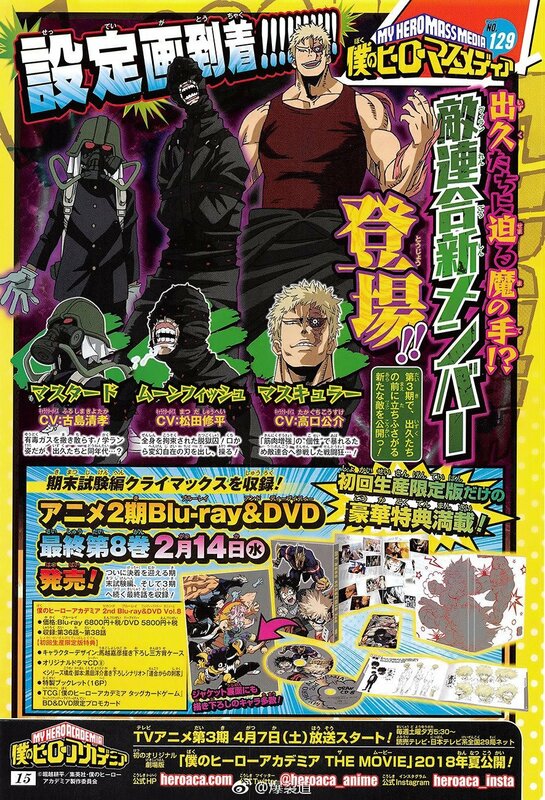 An upcoming movie Boku no Hero academia The Movie will premier this summer. The story-line is set on revealing a previously unseen past of certain characters. Class characters will get a lot of screen-time. Bandai Namco is planning to release an upcoming Boku no Hero Academia One’s Justice game. The game is set for PS4 for release in Japan later this year. As well as PS4, Switch, Xbox One, and PC this year in Europe. I follow the manga also and I have to say, if it lives up to the mangas expectations, it will be very enjoyable to watch. 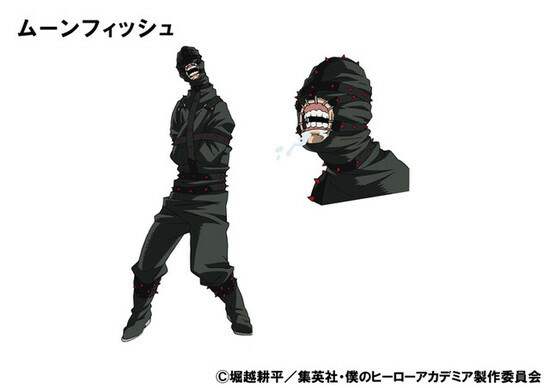 Powers of Mustard and Muscular seem obvious, Moonfish seems to be some kind of a ninja. Damn Damn. I already read the manga. It’s hard to go wrong with this arc. Can’t wait. @totallynotaniceguy:disqus so what do you think is the power of mustard ?